Veda Bhattaram another Indian-American from New Jersey finished third at the finals held last night. 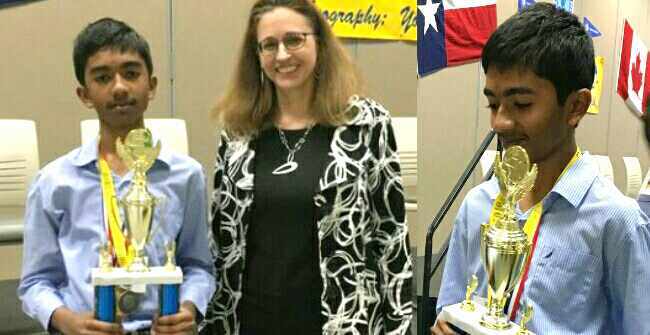 Pranay Varada, the 14-year-old Indian-American student, has won the prestigious USD 50,000 National Geographic Bee competition, maintaining the dominance of the community in the contest. “I was absolutely sure I could win that challenge,” Varada said soon after bagging the coveted competition, which for the past one decade has been dominated by Indian-Americans. A runner up last year, Varada this time did not want to give any chance. He was declared the winner as he won the first tie breaker question when he correctly identified the Kunlun Mountains as the 1,200 mile range that separates the Taklimakan Desert from the Tibetan Plateau. As a result, he gets USD 50,000 in scholarship and other prizes. Veda Bhattaram another Indian-American from New Jersey finished third at the finals held here last night, while Thomas Wright from Wisconsin was declared the runner up. This year, six of the 10 finalists were Indian-Americans. Indian-Americans have won the National Geographic Bee competition for the last six consecutive. Last year, Rishi Nair, a sixth grader from Florida, had won the contest.